Football is truly the world’s game—4% of the population play it and millions watch and talk about it. Although evidence-based medicine is the ‘gold standard’ and should be applied whenever possible, in some fields, ‘experiential’ (‘eminence-based’) medicine is the best available. 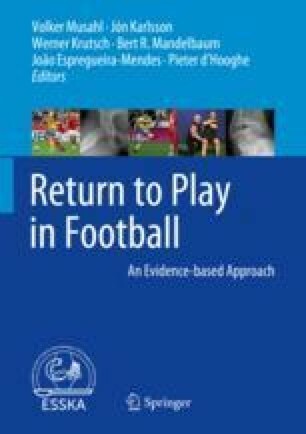 This chapter was requested to explore the senior author’s experience and observations gained from a long period of dealing with high numbers of professional footballers. This challenging group have ordinary conditions, which provide more trouble in treatment than in the ordinary population, and rarer conditions which only occur because of their profession. For coarse outcome measures, such as ACL graft re-rupture, footballers are an interesting group to study, as due to social media and the Internet, 100% follow-up is usual. Furthermore, they test their surgery allowing investigation of what really works, and what does not! Therefore, whilst a lot of work has to be based on the clinician’s experience, there is a growing body of high-quality evidence that can be used to benefit not only players but also the general population. We have no doubt that the treatment of professional footballers’ knees helps the care of the general population.